Let me tell you a little bit about my typical Saturday morning. Usually I get up, grab a cup of coffee, and head out to the couch, to spend my morning watching The Food Network. Yep. That's how I do it on Saturdays. And recently I was watching one show in particular where she was making Beef Wellington for her guests. It's a stunning dish, but let's be realistic, who can really afford a tenderloin for your everyday weeknight meal? I know I can't. That's when the wheels in my head started turning and I thought to myself "What if I did a play on Beef Wellington and used a ground beef mixture instead?" To begin you will need to preheat your oven to 350 degrees. While the oven is preheating you can chop all of your vegetables. Next place a skillet over medium/high heat, add the oil, and allow it to get hot. Once the skillet it hot, add the vegetables. And the thyme and allow the vegetables to cook until they are soft and tender. Once the vegetables are tender you can add the garlic. Let the garlic cook just long enough so that you can smell it coming from the pan. Now you can pour the cooked vegetables into a mixing bowl and let them to cool down for a little bit, just until you can handle them without getting burned. Add in the frozen peas. This will help speed up the cooling process. With regular Beef Wellington you would smear mustard all over the outside of the tenderloin. Since I can't exactly do that, I decided to use The Real McCoy Mustard Sauce in my meat mixture. It is an amazing product made right here in West Virginia by a company called Appalachian Mountain Specialty Foods. The Real McCoy Sauce adds some amazingly rich flavor to the filling, but if you don't have access to this sauce a 1/2 c. of regular Dijon mustard will do the trick. However, you can order this sauce from anywhere in the country by clicking HERE! Now you are going to add HALF of the beaten eggs to the meat mixture. Now gently combine everything together in the bowl. Now you will need to flour a flat surface to roll out the puff pastry. I really like using this silicone pastry mat for this. It helps with the sticking and clean-up is so simple. Unfold it and lightly dust the top as well. Now roll it out until it is roughly the size of a baking sheet. Place the meat mixture, in a log shape, at one end of the pastry. Careful to tuck the sides in as you go. Once you get to the end of the pastry, brush it with a little of the beaten egg mixture to seal the seam. Finish rolling it so that is it seam side down. Place back in the skillet that you sauteed the vegetables in and brush the entire thing with the egg mixture. This will make it nice and golden brown. Cut a few slits in the top for venting. And place into the preheated oven for 1 hour. Now look at that! Is that not a beautiful main course or what!?! It has all of the succulent flavors you love in regular Beef Wellington, but at a price point you and I can live with. 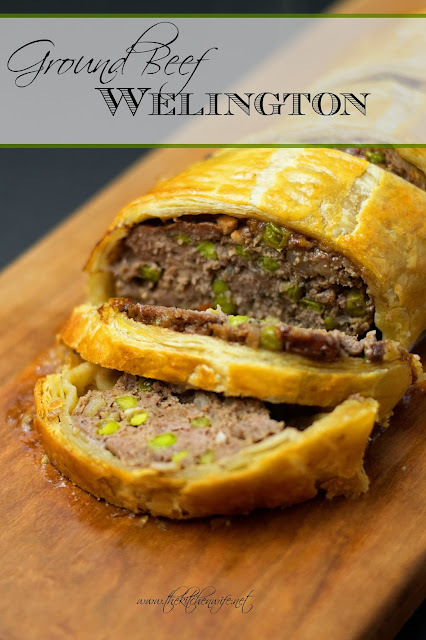 In fact, I would say that this Ground Beef Wellington is even good enough to serve at your next dinner party. I love thinking outside the box to achieve great flavor in my kitchen and I would love to hear some of the ways you do just that in yours! Place an oven proof skillet over medium/high heat and add the oil. Allow the skillet to get hot. Once the skillet is hot, add the carrot, onion, celery, salt pepper, and thyme. Cook 2-3 minutes until the vegetables are soft and tender. Now add the garlic and cook until you smell it coming from the pan. Now lightly flour a flat surface and lay out 1 sheet of the puff pastry. Lightly flour the top and roll it out to the size of a baking sheet. Place the meat mixture, in a log shape, at one end of the puff pastry. Then begin to roll it up, careful to tuck in the sides as you go. Once you get to the end, brush the end of the puff pastry with the egg wash to seal the seam. Place the Ground Beef Wellington back into the skillet and brush the remaining beaten egg mixture all over it. Cut 3-4 air vents in the top and place into the oven to cook for 1 hours. *If you can't get The Real McCoy Mustard Sauce use 1/2 c. of Dijon mustard instead. 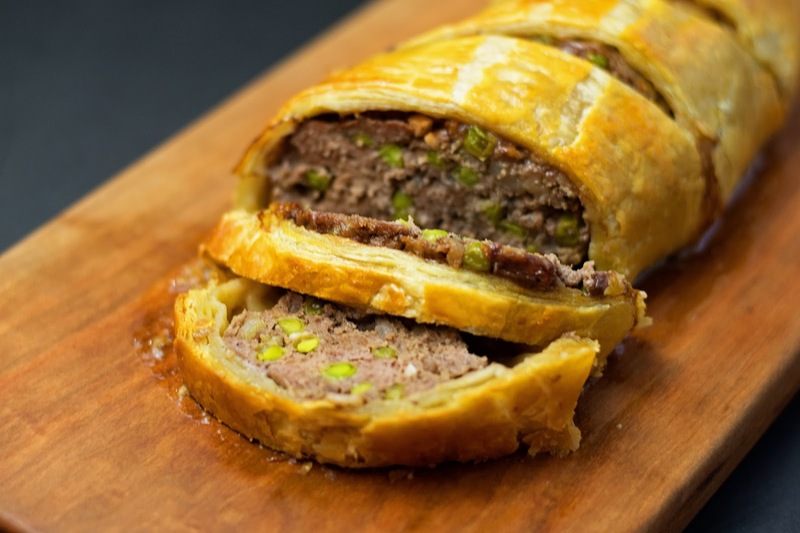 What a fun and creative take on a traditional beef wellington. I must try this! I have always wanted to make beef wellington, but was always as little bit afraid to. I know this would be something I could master! Thanks for sharing this recipe. Yes, this is so simple, but still elegant and delicious! I can't wait to hear about how this turns out for you! That is so sweet! You have no idea how much I value that! I know you all are going to love it! And tell your daughter congrats for me! Hi,great idea this is.Just a question,i'm not a big fan of raw onion..will it cook fine when the wellington is done? Yes, the onion does continue to cook down, but let me offer you a couple alternatives. One, dehydrated onions flakes. They become very soft as they cook and you won't even notice they are there. You can also omit the onion all together and just use 1 1/2 tsp. of onion powder. You get all of that great flavor without the actual onion. I hope this helps. Hi! Thank you for this recipe. I am using it to make "Meatloaf Scotch Eggs," adding only 1/2 an onion, 2 cloves fresh garlic, 1 egg, and 1/2 cup breadcrumbs to 1 lb. hamburger, and then wrapping 2 1/2 oz. of meat around a peeled, soft boiled (4 minutes) boiled egg. I then wrapped Ruff Puff pastry dough around the meat wrapped egg, and am baking them for 35 minutes @ 375 degrees. I was concerned about baking the dough too long, since most puff pastry recipes call for 15-20 minutes. So your Wellington at 350 for an hour rests my mind. Thanks again! I love you idea! How cool! I will have to give it a try! And I promise you that that puff pastry was not burnt or dry at all. I have made this several times and it always comes out perfect!